All of your happy little Love Bugs will be dancing merrily around on this one-of-a-kind Personalized Love Bugs T-shirt. A tremendous gift that Grandma, Mom, Nana or favorite Aunt will treasure always. Personalized Grandma Shirts honor your Mother, Grandmother, Sister or Best Friend which proudly displays all of the love you share each & every day. Your Custom Printed Love Bug shirt is available on our 100% Cotton Preshrunk River Blue T-Shirt, machine washable in adult sizes S-3XL. Includes FREE Personalization! 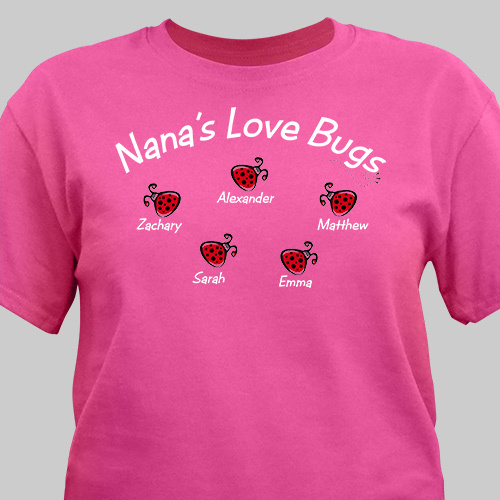 Personalize your Love Bugs T-Shirt with any title and up to 30 names. Each child's name is printed with their own lady bug. The shirt arrived before expected and was really cute. Good quality shirt as well. Decided to try a shirt in blue, usually I like pink or green. This shirt looks very well with all the strawberries and names on it. Like the quality and colors of the shirt and it doesn't fade. These shirts last for a long time - I wear them everyday as I do Daycare. Fits well and sizes are right on. Love my shirt. My kids and grands love it. Shop GiftsForYouNow.com for all your Personalized Gifts for Her. We have a wonderful selection of personalized gifts suitable for every holiday, special occasion or family event. Whether you are looking for a Custom Printed T-shirt or an Engraved Keepsake, GiftsForYouNow.com has what you are looking for at very affordable prices.